Details at the end of this post on how to win a copy of Dead Rapunzel, along with a link to purchase the book where a portion goes to support KRL & an indie bookstore. Rudd Tomlinson just made the biggest and proudest purchase of artwork in her career; too bad it turns out to be the purchase of her lifetime! Moments after finishing her daily breakfast at the Grizzly Bear Café, Rudd is fatally struck down by a truck. The traumatized driver swears that she was pushed out in front of him, and a dishwasher backs up his testimony. Rudd was the much-younger widow of Philip Tomlinson, whose estate was worth nearly sixty million (his adult children were less than thrilled to discover Rudd was the prime beneficiary). Her best friend Judith Fordham is the executor of the trust, and Loon Lake Police Chief Llewellyn Ferris fears that Judith may be perceived as one more obstacle in the dysfunctional family’s path to wealth. Once again Lew calls for assistance from her obliging boyfriend, retired dentist Paul “Doc” Osborne, for his investigative skills as much as for his forensic consultation. Along with fishing guru Ray Pradt, the couple investigates which of the Tomlinson family members is trying to earn an early inheritance. Houston depicts the freezing but beautiful Wisconsin setting so affectionately that readers will want to plan their next flight there, despite the often thirty-below temperatures! This fifteenth in the series continues to develop the very realistic relationships of these characters, who have all grown closer despite—or perhaps because of—hardships, traumas, and past resentments. The novel’s title comes from one of Rudd’s favorite trout flies, and this underlines the sport’s importance to both author and Loon Lake residents. Fly-fishing allows them to connect with one another as much as with nature, and it is while out on the lake that Doc, Lew, and Ray often have their most meaningful conversations. Seeing Doc renew his relationship with his daughter is just as rewarding as the mystery, which remains at the forefront of this compelling novel of a family torn apart by greed. 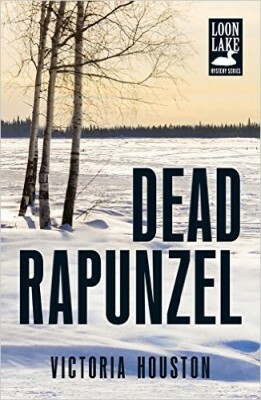 To enter to win a copy of Dead Rapunzel, simply email KRL at krlcontests@gmail[dot]com by replacing the [dot] with a period, and with the subject line “Rapunzel,” or comment on this article. A winner will be chosen August 1, 2015. U.S. residents only. If entering via email please include your mailing address, and if via comment please include your email address. Dead Rapunzel sounds very good! I’ve not read this author before and will be looking for more books. Thank you! New to me author. And this story sounds like a book I would love. These books are wonderful. I love them. The latest one sounds terrific. Sounds great. Will look into it!